Sprinkled on yogurt or ice cream, in a salad, dehydrated in trail mixes, in pancakes and waffles – there’s no shortage of ways to incorporate these lovelies into your diet. As you might imagine my preferred method of eating berries is via smoothies. People often get carried away with sugary fruit in their smoothies creating what I like to call a sugar-bomb. That’s hard to do with berries, which are naturally sweet, but don’t contain too much sugar. Berries are the epitome of delicious and nutritious! For my version of this smoothie I used frozen blueberries and raspberries. The strawberries were fresh from the farmer’s market. These berries may not be accessible to you. Substitute the berries that are local to where you live. 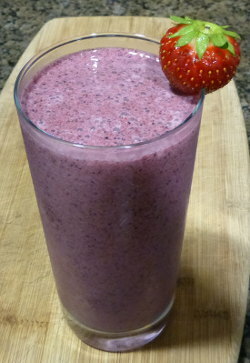 I considered naming this Local Berry or Michigan Smoothie to emphasize using local ingredients. Enjoy! I’d love to know if you try this super berry smoothie and how you liked it. Please leave a comment below. Happy Blending! This is my go to smoothie. I just never used vanilla extract but will try it. I also use less baby spinach leaves. Tried kale but no no no. My Dr. told me about maca and I also use chia/flax. I think you’ll like the slight flavor enhancement from the vanilla extract. Maca and chia/flax are excellent add-ons. Tried a variation of this smoothie today. Used frozen blueberries, one-half cup of coconut milk, and strawberry Kefir in place of yogurt. Instead of vanilla, I added 1/2 teaspoon of tumeric and 1/2 teaspoon of cinnamon. It was amazing. Is the ebook still available? I would love one please! Absolutely frozen berries are ok to use, Stacey.